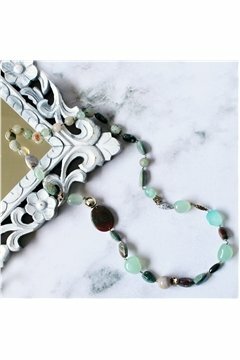 An exclusively designed and handmade collection of Gemstone Necklaces with each stone of unique shape and size. Going through a twelve-step process of cutting and polishing, these gemstones stones are also a tool for their natural energy, and healing properties. 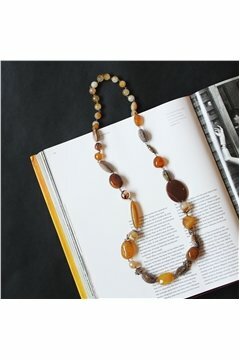 The stones used in the collection are Rose Quartz, Tiger Eye, Aquamarine, Carnelian, Jasper, Garnet & Aventurine, etc. When selecting your healing crystals or stones, it is important to trust yourself and intuition. Properties of some of the Gemstones: Rose Quartz – Stone of Love, Beauty, Happiness & Peace Tiger Eye – Stone of Wealth, Fortune & Success Aquamarine - Stone of Truth, Peace, Meditation & Protection Carnelian – Stone of Creativity, Motivation, Confidence & Vitality Jasper - Stone of Ability, Healing & Tranquility Aventurine - Stone of Opportunity, Wealth, Luck and Optimism Garnet – Stone of Energy, Health, Passion and Energy Flow. The gemstones are also used for Reiki healing in the west. 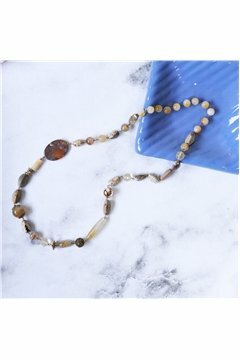 Energy workers add the subtle vibrations of stone energy as a complement to their healing sessions as these stones can help to improve your mood and overall well being in more ways than one, It’s jewellery designed to make you feel good, literally!